With changing light and the all-seasons-in-one day weather that the Lake District is famous for, it is often said that you never see the same view twice in the Lake District. This is certainly the case when viewing the spectacular scenery of this beautiful National Park from the elevated position on horseback. Like horses, when set for some fresh air in glorious landscape we enjoy different experiences. A challenge, peace and serenity or adventure. From horseback you can take your pick. A horse riding experience is an activity that offers something for everyone. For the experienced, the terrain here in the Lake District is like no other. It offers an opportunity for an exhilarating beach canter or a challenging fell trail, not to be missed. For families or novice riders, getting out on horseback is an exciting and memorable way to enjoy the idyllic, pastoral countryside and splendid views. Let the great mares do the hard work, and enjoy an hour and a half gentle walk through meadows and farmland, along a peaceful valley bottom, crossing streams and passing through woodland. This is a peaceful and enjoyable way of soaking up the spender of the Lake District countryside and a superb family experience. Everyone can sit back and enjoy the view on a guided walk, covering miles more easily than on two feet, without having to check maps and hurry tired, little legs along. Do you have the stamina for a longer fell ride? Prefer letting off steam in an off road canter? Or is the excitement of being on horseback enough for you? Either way a holiday in the Lake District is about the relaxing benefits of enjoying idyllic rural scenery. Plus, being with well-trained horses that are familiar with the terrain is undoubtably calming and relaxing itself. Be at one with the natural rhythm of your horse as she clip-clops along a scenic bridleway, stops to take a drink and cool off in a tarn or stream. Don’t forget refreshments and perhaps a picnic for the riders too. There are 1,927.5 miles of public Rights of Way across the Lake District, and whilst not all are permissible by horse, many are. In fact, Cumbria has the highest total of bridleways in the UK. Look out for yellow and blue circle way markers. These are bridleways. 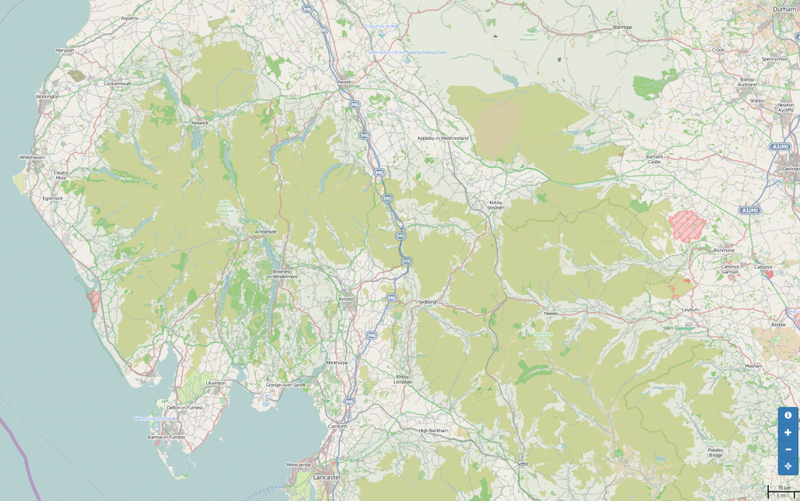 This is an excellent interactive map for finding way marked Bridleways as well as Public Footpaths Map Cumbria Bridleways across the Lakes. The Lake District, with its dramatic mountain scenery, remote valley’s, clearwater rivers and lakes and forest trails, is known as the ‘adventure capital’ of the UK. For many, adventure is the opportunity to focus, let adrenalin flow and enjoy feel-good endorphins. And one such way is to experience a beach canter or challenging fell hack. The place to head for for an experience on a ‘real horse’ is Cumbrian Heavy Horses , the UK’s only specialised ‘Heavy Horse’ riding experience. Visit little know, but the beautiful, dunes of the Cumbrian coastline. Enjoy the power and magnificence of a Clydesdale, Shire or Ardennes, some of the largest horse breeds. 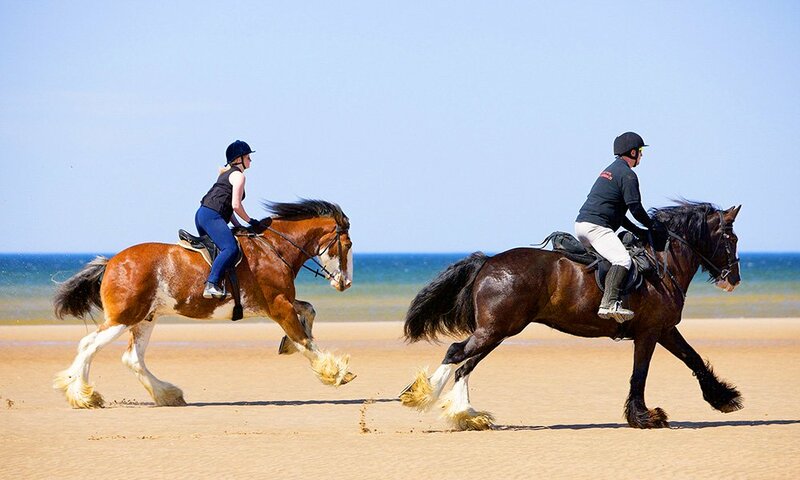 Both rider and horse will enjoy the exhilaration of a canter on the vast, empty beaches where you really can feel at one with nature. Feel at one with nature and enjoy a gallop on a Clydesdale with Cumbria Heavy Horses on the beautiful beaches of the Irish Sea. For others, pleasure is found in experiences enjoyed as a group. Pony trekking can be an ideal activity for a group and is a great way to get out into the Lake District countryside. A guided hack could take you to the heights of ‘Garburn Pass’ in the secluded Kentmere Valley. Or on a tour through the historic Troutbeck village, paddling on the shores of Wast Water taking in ‘Britain’s best view’. Or even trekking on open fells with views onto Ullswater. Park Foot Pony Trekking on Ullswater, in the North Lakes, is ideal for all the family (over 5 year olds) to turn up without any experience or kit and enjoy a go on some beautiful, friendly pony’s, heading straight onto the fells to enjoy superb views looking down on Ullswater. Lakeland Pony Treks on Windermere, is a family riding centre based in the heart of the Lakes, only 2 miles form Windermere. Fancy having a go on your very own Black Beauty or perhaps ‘Joey’ the War Horse? Experienced riders are invited to enjoy riding a stunning Friesian horse with Black Horses, based in Cartmel, on Cumbria’s south coast. Enjoy a quiet hack through the historic village of Cartmel, or take in the views across Cartmel valley and Morecambe Bay from the top of Hampsfell or perhaps you’d fancy a faster beach ride. For experienced riders, take a picnic and enjoy a full day riding on the fells and through the valleys of the UK’s famous Lake District landscape. Drink in the views as you sit elevated above stone walls and explore hard to reach, bracken covered paths, that are more accessible on horseback. Whilst your nerve will be tested in a trot up a fell, you’re rewarded with spectacular views without the exertion! There is something inherently romantic about a journey on horseback. Whether it is the nostalgic traditions of a working horse, or the slowed-down pace of travelling to the natural rhythms of a horse, few experiences are as romantic. Add to this the backdrop of a secluded beach, dusk light and you’ll feel like you’re starring in your very own romantic movie. For a special occasion why not surprise a loved one with a horse and carriage collecting you from you holiday cottage in the Lake District. Black Horses offer a champagne carriage ride around the romantic hamlet of Cartmel and the surrounding country lanes and idyllic woodlands, pulled by gentle black Friesian’s. You can even be picked up from your holiday cottage front door. Have a look at our cottages in Cartmel for help planning a special occasion escape in the Lake District. Following your giddy gallop, perhaps book yourself into one of our cottages with inclusive leisure club access or one of the region’s superb spa facilities to relax any aching muscles for those unused to riding horseback. 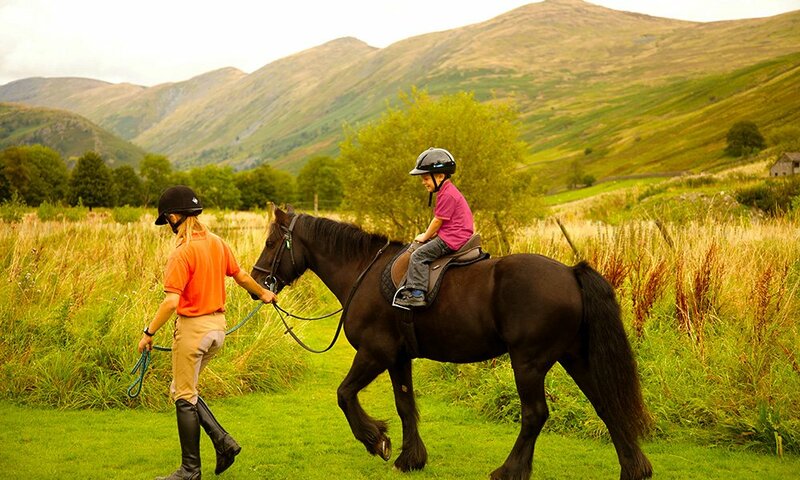 Whether you’re confident on horseback or an equestrian escape is something new, we’d recommend taking to the saddle as a superb and memorable way to enjoy the Lake District.